FDA Approves 23andMe Genetic Tests For 10 Diseases : Shots - Health News The company 23andMe is now allowed to market tests that assess genetic risks for 10 health conditions, including Parkinson's and late-onset Alzheimer's diseases. 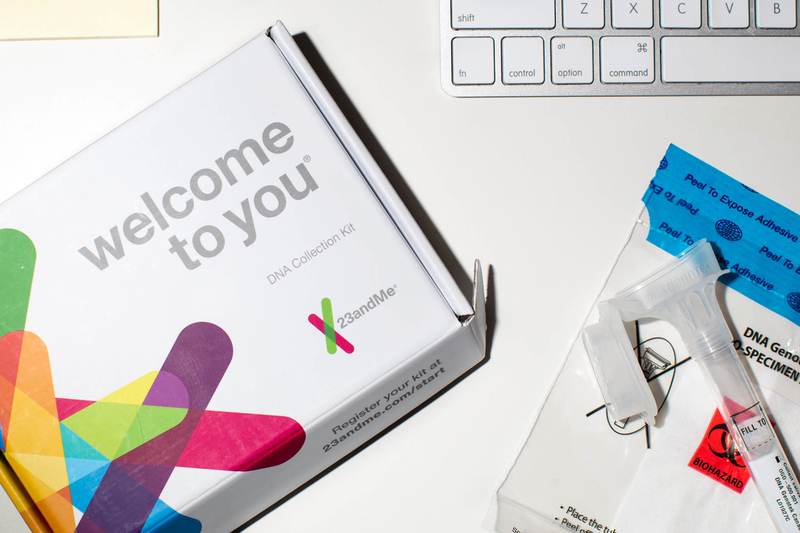 23andMe is now allowed to market tests that assess genetic risks for 10 health conditions, including Parkinson's and late-onset Alzheimer's diseases. The U.S. Food and Drug Administration approved 23andMe's personal genetic test for some diseases on Thursday, including Alzheimer's, Parkinson's and celiac diseases. The tests assess genetic risk for the conditions but don't diagnose them, the FDA says. The agency urges consumers to use their results to "help to make decisions about lifestyle choices or to inform discussions with a health care professional," according to a press release about the decision. Jeffrey Shuren, the director of the FDA's Center for Devices and Radiological Health, wrote, "it is important that people understand that genetic risk is just one piece of the bigger puzzle, it does not mean they will or won't ultimately develop a disease." Other known factors that can play into the development of disease include diet, environment and tobacco use. The FDA has previously scolded the company for marketing the personal genetic testing kits without the agency's consent. In 2013, the agency told 23andMe to stop selling its personal genome kits in the United States until they gained FDA approval by proving they were accurate. The company's $199 Health and Ancestry test is available directly to consumers, without seeing a physician or genetic counselor. Consumers' DNA is extracted from a saliva sample. After mailing in their sample, people can see their results online. "This is an important moment for people who want to know their genetic health risks and be more proactive about their health," said Anne Wojcicki, the CEO and co-founder of 23andMe, in a company press release. Sharon Terry, the CEO of the Genetic Alliance, a nonprofit organization that advocates for health care for people with genetic disorders, likens it to another consumer test. "Women learn they are pregnant using a test directly marketed to them and buy it off the shelf in a drugstore," she told NPR. "In 10 years we will marvel that this is an 'advance' at all. Imagine pregnancy tests being only available through a doctor!" Robert Green, a professor of medicine at Harvard Medical School, says people should be able to access genetic information in whatever way is best for them. "Some people really want this [genetic] information on their own, and others want it through their physician," he said. "Both those channels are legitimate. People should just be aware that this information is complicated." Some health professionals worry that consumers will "take the results and run," as Mary Freivogel put it. Freivogel, a certified genetic counselor and the president of the National Society of Genetic Counselors, added that genetics are just "one piece to the story when it comes to developing a disease." Freivogel said speaking with a genetic counselor before getting tested for disease is important. "Direct-to-consumer testing takes away a pre-test conversation," she said, where counselors can help patients think about questions like: "What do you want to know? What are you going to do with this information? Is it something you're prepared to know, or is it going to just make you anxious?" And it isn't clear what consumers should do with their newly calculated disease risk, especially for conditions like Alzheimer's for which there isn't a cure or even a course of action to prevent the disease. What's more, having the genes is not the same as having the diseases the genes are associated with. A person may have genes that are associated with Alzheimer's, for example, but that doesn't mean he or she will ever get the disease. Conversely, some people develop Alzheimer's without the identified risk genes. The Alzheimer's Association does not recommend routine genetic testing for the disease in the general population because it can't "productively guide medical treatment." A genetic test result for Alzheimer's is "not going to provide useful information even if you're at an increased risk," said Keith Fargo, director of scientific programs at the Alzheimer's Association. "It's not like there's a drug you can take right now [to prevent the disease] or a lifestyle change you can make that you shouldn't make anyway," such as exercising and eating right to keep your brain healthy. John Lehr, the CEO of the Parkinson's Foundation, says personal genetic tests can help identify risk for Parkinson's disease. But, he wrote in a statement following the FDA's announcement, the foundation recommends "that people who are interested in testing first seek guidance from their doctors and from genetic counselors to understand what the process may mean for them and their families."